An Egyptian-born artist has covered a semi-derelict estate in Haggerston with painted murals to brighten up the boarded up flats before they are demolished in the summer. Nazir Tanbouli, who has a studio on the Kingsland Estate, wanted to share his work with local people. After receiving permission from the housing association he began work on The King’s Land project in March, a site specific urban installation involving a series of murals of mythical creatures. Mr Tanbouli said: “I felt that the estate was too depressing and the neighbours felt the same. When I did my first mural on my studio exterior, people come and took photos of themselves next to it. “It made them smile and feel good, and I like that. I want to provide a counterpoint to the bleakness of empty flats, but at the same time, celebrate the area with some fun, unusual art. The estate will be knocked down in the summer as part of a large regeneration project led by London and Quadrant Housing. He completed the seventh mural in March and the eighth is due to be completed by the time of the Diamond Jubilee. 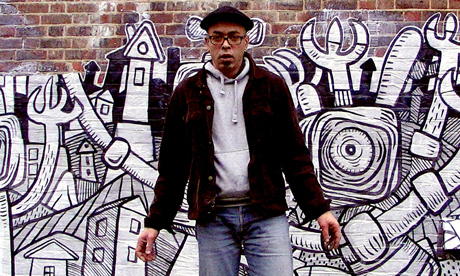 Nazir Tanbouli was born in Alexandria, Egypt and was part of Egypt’s first mural painting crew. After 30 years in Egypt he moved the UK to study at Camberwell College of Art and now has a studio in Hackney. 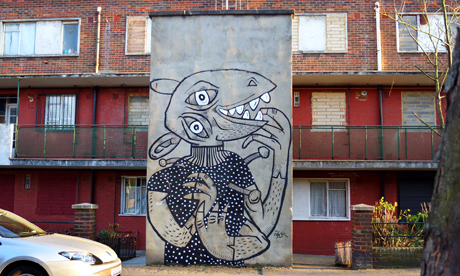 The King’s Land Mural Project can be found on the Kingsland Estate, between Whiston Road and Laburnum Street, E2.